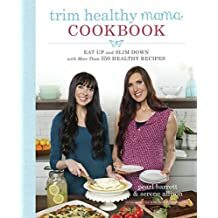 Trim Healthy Mama Cookbook Giveaway! It’s time for another giveaway! I am giving away another copy of the Trim Healthy Mama cookbook. This is my current fave. I use it daily! My girlfriend read my blog post over here, where I first reviewed the book and offered it in a drawing, in Dec. 2016. She bought the cookbook, applied the principles, and has lost over 40 lbs! She has promised a blog post sharing her success story soon! This eating plan really works! It works because the food satisfies your cravings for sweet and fatty things. You don’t have to feel deprived on this diet. So if you haven’t read my first review, go over here to do that. the praline bars, these are great, grain-free granola bar alternatives for being on the go. I love to make a pan before road trips to eat in the car. I wrap them in freezer paper or parchment paper. Is your mouth watering yet? Good! Go get the book today, or enter my random drawing if you can wait to see if you are a winner. Comment below on why you want the book and you will be entered in the drawing. Drawing will be held July 1 around 7 PM AZ time. 9 Responses to Trim Healthy Mama Cookbook Giveaway! I am excited to enter to win this book and cook new recipes for my family!! I would love to enter the drawing. I could use some more amazing recipes! I have the cookbook checked out from the library right now and we are enjoying the wonderful recipes, too. Thanks for sharing a list of your favorites – we have tried some of them and love them, too! We need our own copy because we are getting the library’s copy a little dirty from use. My oldest daughter LOVES the drinks. Just like KeeNan, I have this checked out from my library. I made the special occasion chocolate cake yesterday and it was great! This way of eating is a little complicated, but I feel good about it seems sustainable. I would love to have my own copy. Thank you!! Yay! I love love love this book and would like to enter the drawing for my mother. YES!… My mouth IS watering. Holy moly, those recipes all sound divine! I want to dive right in and try ALL of them! You made them sound so tasty and tempting. I am doing a healing diet currently, working to overcome fatigue, brain fog, and low-functioning that has kept me from ‘living’ life for way too long!… So this book would be extremely helpful and appreciated! I would love to have this cookbook. After just having a baby, time and resources are short and it would be fantastic to have some new recipes to try. Thanks for the opportunity! All of those dinner recipes you listed sound awesome, especially if they are actually going to be good for me! Congrats to Melanie Dewey, winner of the random drawing! Melanie, i will be contacting you shortly via email to get a snail mail address for you!